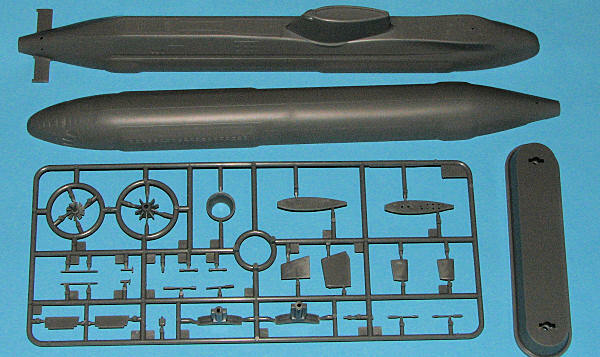 Hobby Boss' new 1/350 modern submarine is a great addition to their growing su b fleet. This one is about as simple as they come. The hull is divided into upper and lower sections, with the sail molded into the upper hull. Thee are dive planes, rear fins and rudders to add along with a ducted prop. Atop the sail, one can install a section that has all the various antennas and periscopes buttoned up, or one can build the sub with all of these extended. There is a photo etch fret that has the boat's nameplate, a prop (there is also a plastic one), and some small deck fittings. All of this fits atop a small display stand on which the nameplate fits. Instructions are well done with well drawn construction steps. Paint references are for a number of different brands and decal placement is shown on the full color five view color and markings guide. There really isn't that much to say about this boat as it really isn't that parts intensive. Many of us like to build a submarine or two every now and then to relax from some of the more intensive kits we usually build. This is one of those kits and as such, it is highly recommended for a change of pace and because it is a neat looking boat.